The ccMiner fork from djm34 got updated to add support for the Keccak algorithm used by crypto coins such as MaxCoin along with some performance improvement for the Whirlpool algorithms. 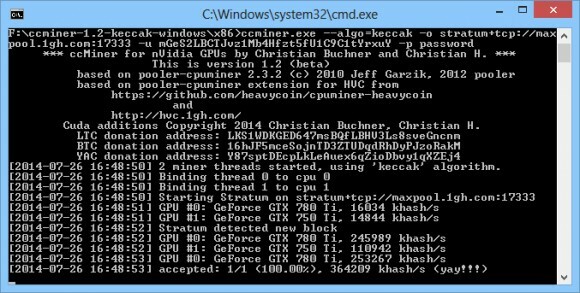 the Keccak algorithm is already supported by CudaMiner, but since it hasn’t been updated for quite a while and ccMiner has become the GPU miner of preference for Nvidia miners you can now mine coins using this algo with it as well. In terms of performance improvement for the whirlpool algorithm, with the new version we are getting 4550 KHS on a GeForce GTX 750 Ti, up from about 4400 KHS that we got with the previous update. 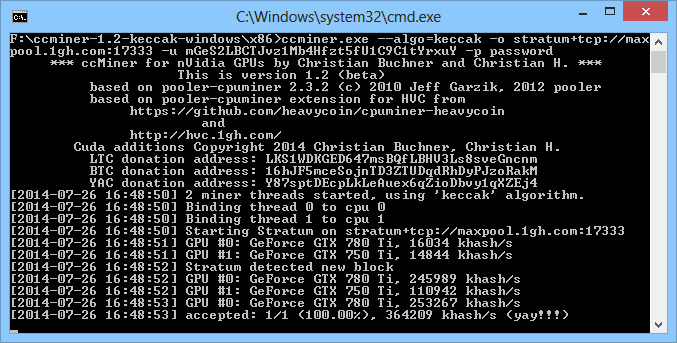 On a GeForce GTX 780 Ti the hashrate is up from about 11500 KHS to 13000 KHS using the new code.